Converts SQ-80 and ESQ-1 sequences to Standard Midi Files (SMF). Converts Type 1 SMF sequences to SQ-80 sequences. Lists SQ-80, ESQ-1 and SMF sequences on the screen or printer. Digital Download Only. 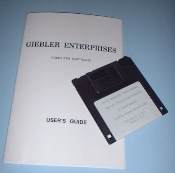 Order a diskette & manual under Accessories. Requires internal (non-USB) floppy disk drive. MS-DOS Programs. Will NOT run under Windows 7, NT, XP, 2000 or Vista.